How to Convert PDF to ePub on Mac OS X? PDF is an ideal file format for document distribution. But as an eBook format, PDF is not so good. PDF file is too big to read on small-screen devices, like iPhone 5, iPod touch or iPad mini. You have to adjust the PDF to the display and scroll back and forth to read the content. To get a better e-reading experience, we suggest you convert PDF to ePub format, which is fully compatible with most of the e-reading devices..
How to Insert Pages into PDF Files? How to Add Stamp to PDF Document Easily? In this article, we mainly tell you how to convert PDF to ePub on Mac computer. 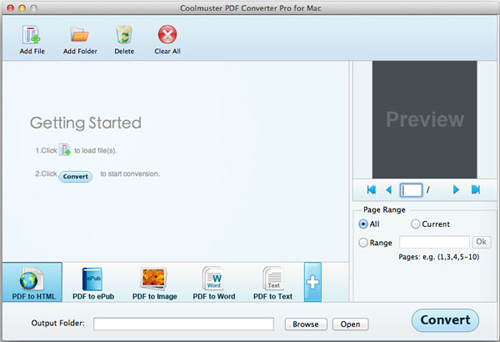 What you need is a professional PDF conversion program like Coolmuster PDF Converter Pro for Mac to help you transform PDF files or eBooks to ePub format quickly and easily with original file layout and quality fully preserved. Just in 3 steps, you make it. Read on to learn the details about the user steps. Tips 1: PDF Converter Pro for Mac also allows Mac users to convert native PDF files to editable Microsoft Word, Text, Images (.jpg, .bmp, .png, .gif, .tiff, etc) and HTML Webpages on Mac. Tips 2: Windows version is also available, just click PDF Converter Pro to get it. Import the PDF files that you want to convert to ePub by clicking the Add Files or Add Folder button. You can upload up to 200 PDFs at one time and convert them simultaneously. Click to choose the conversion type you need for the output file. You are provided with 5 conversion types like PDF to Word, PDF to ePub, PDF to Text, PDF to Images and PDF to HTML. Here, you should choose PDF to ePub conversion type. Select an output location for saving the converted files by clicking the Browse button. Note: You can preview the imported PDF in the thumbnail window in the right window and customize page range for the PDF files to convert. Default page range for the PDF to ePub conversion is All Pages. Click the Convert button to start the conversion on your Mac machine. In a few seconds, the conversion process will be finished. You can find the converted ePub files directly by clicking the Open button. Quite easy, isn’t it?